If you need specific information on getting someone out of jail, please call us at (602) 258-4488, or fill out the information request below and we will be glad to help you. Maricopa County Bail Bonds is committed to helping you understand the bail bond process and providing the help you need. We belong to a strong affiliate network and can have your bond posted bail anywhere in Arizona or the United States. Please use our City Guides for those hard to find phone numbers and addresses for Courts, prosecutors and police. Maricopa County Bail Bonds is happy to provide Mobile Bail Bond Service throughout the “Valley”. Why drive into town to meet with a bondsman when a bondsman can come to you or meet at a mutual convenient location? 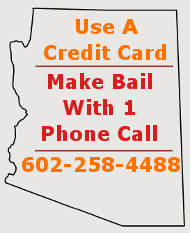 Maricopa County Bail Bonds reduces the stress from having to post bail. Call (602) 258-4488 and let us help you.